Sudah dipesan 6 tamu hari ini. Ada pertanyaan untuk Railay Bay Resort & Spa? Terletak strategis di Krabi, Railay Bay Resort & Spa adalah tempat yang luar biasa untuk memulai penelurusan kota yang aktif ini. Hanya 15 km dari pusat kota, lokasi properti yang strategis ini memastikan para tamu dapat menuju tempat-tempat menarik dengan cepat dan mudah. Dengan lokasi obyek wisata utama di kota ini yang sangat dekat seperti Pantai Railay, Pantai Phra Nang, Real Rocks Climbing School & Shop, tamu akan sangat menyukai properti ini. Railay Bay Resort & Spa berkomitmen untuk memastikan kenyamanan selama Anda menginap dengan menawarkan pelayanan superior dan sejumlah fasilitas kepada para tamu. Properti ini menawarkan sejumlah fasilitas di tempat untuk memuaskan segala jenis tamu. Nikmati fasilitas kamar berkualitas tinggi selama Anda menginap di sini. Beberapa kamar memiliki ruang keluarga terpisah, kolam pribadi, akses internet WiFi (gratis), bak mandi whirlpool, kamar bebas asap rokok, yang disediakan untuk membantu Anda mengumpulkan tenaga kembali setelah beraktivitas seharian Properti ini menawarkan berbagai pengalaman hiburan unik seperti hot tub, kolam renang luar ruangan, menyelam, pijat, taman. Apapun tujuan kunjungan Anda, Railay Bay Resort & Spa adalah pilihan menginap istimewa di Krabi. Anak berusia 4 hingga 11 tahun wajib menggunakan ranjang tambahan. Mohon informasikan pihak properti mengenai jumlah anak dan usia sebelum kedatangan. Anak berusia 4 hingga 11 tahun akan dikenakan biaya THB 1,000 per anak per malam dengan ranjang tambahan dan termasuk sarapan. Properti ini hanya bisa diakses dengan perahu. Tamu disarankan naik taksi menuju Dermaga Ao Nam Mao atau Pantai Aonang dari Bandara Krabi. Biaya tambahan untuk transfer bandara berlaku. Untuk informasi lebih lanjut, silakan menghubungi properti. Friendly staff, beautiful location and lovely room. Railay Beach is our favourite place in Thailand if we had to choose, the beach is stunning with Walking Street providing great culture and food. Will definitely be back! The railay Bay resort was beautiful and welcoming. 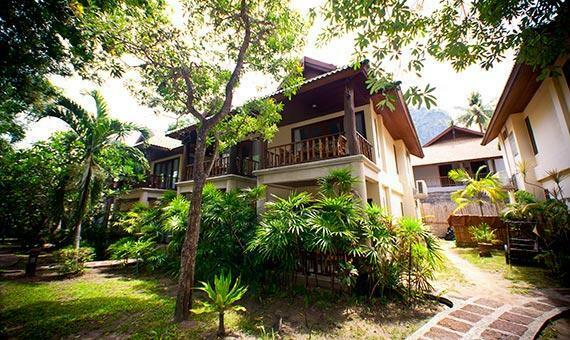 The location is indeed great – right on the Railay Beach where you can watch spectacular sunsets. But otherwise, at its premium price point, the resort is quite disappointing: - Wide choice, but mediocre quality breakfast; - A terrible sunbed situation at the main pool. The grounds of the resort are huge and hundreds of guests can stay on it, but there are only around 20 sunbeds at the main pool on Railay Beach, which are reserved early in the morning with towels; - The grounds of the hotel are not well kept – there are areas that you have to walk by that smell terribly. Same funky smell from piping in the bathroom; - The hotel does not respect its guests and lists a bunch of fines everywhere in the room for any items that you may break or even for towels if you stain them with cosmetics, blood etc. Disappointing experience. Railay is only good for a day trip. The small peninsula is dominated by 3-4 unsustainable resorts. The shopping street has a handful of horrible and expensive restaurants with very bad service. 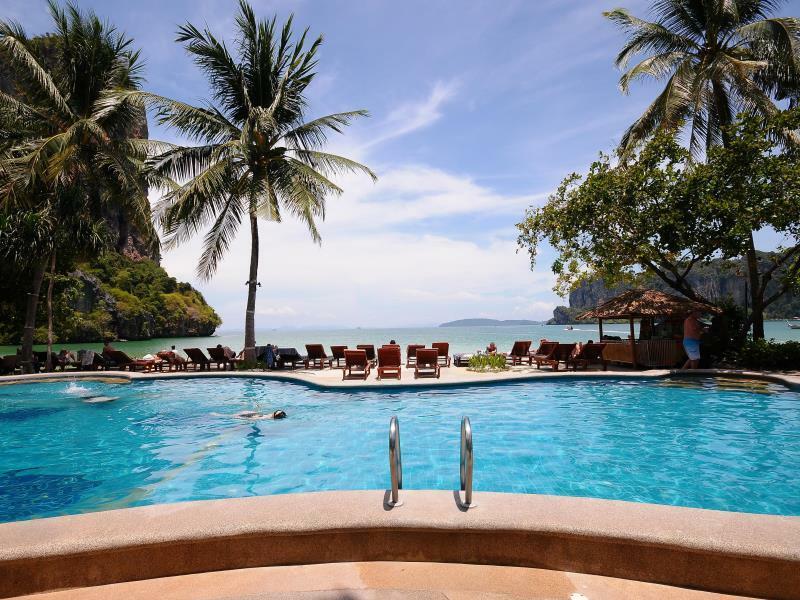 Railay Bay Resort and Spa is dated, the staff are unhelpful (not willing to accommodate my last minute itinerary change due to family emergency), and are out to add extra charges to your bill with any given opportunity. For example, checkout requires a house cleaning check, and they charged for a water we didn't drink. Signs in the room say that any stain from the red clay mud on towels or bedsheets will be charged. The worst part of it is that there is no sustainable environmental policy. Plastic straws are always served with drinks, they do not recycle, and their breakfast take away was full of plastic bags and containers. Before you spend a premium on your vacation, I would highly recommend not supporting any resorts in Railay Bay (only good for a day trip). This hotel is amazing, specially the infinity pool. Staff is very friendly. We were vegetarian and their staff helped us so much that we can best have food. we were here for 2 days and wished we could have stayed more. Great location, great breakfast buffet, great internet connection, amazing pool! I wish I could come back there soon! The only downside is not particular to the hotel per se, but if your room is near one beaches you will hear motorboat coming and going all the freaking time. But I think that's the way in Ralay anyway. Nice location. Staff a little unfriendly compared to other places. Breakfast good. Guests leave their towels on the pool seats to ‘reserve’ them all day so there are usually no seats available or actually in use. The hotel should address this. Nice big rooms. Our room was all the way to the other side of the island on the east side which had a great sunrise view. A far walk to west side but a nice one. The only problem is the east side gets very very low tide, so there's just yuky sand for hours on that side till the tide comes back up. But the staff very friendly and food was great. We stayed at Railay Bay Resort for one night due to availability on short notice (stayed at Diamond Cave Resort for 3 more nights), but wish it was longer. We had a private jacuzzi villa that had an outdoor area with lilypads and frogs. The room was very spacious and the bed was the softest (and most comfortable) we've had while staying in Thailand over the past 3 months (most are always very firm). The location is perfect for staying on Railay, as it spans all the way from Railay West beach to Railay East with an easy to navigate walkway with trees and lights. My wife was sick that day with the flu and had room service delivered which was delicious. I enjoyed a meal at their restaurant while watching sunset, which was the perfect viewpoint for sunset on Railay. The food was just OK, standard Thai dishes, nothing special, entree was a little cold but the spring rolls were very good. Worth it to enjoy a sunset view, but there are better places to have dinner on the peninsula. We enjoyed our time at Railay Bay - AC worked great, and it is surly one of the nicest places to stay in the Bay. We were well taken care of and the rooms were nice and comfortable. The breakfast was pretty good as well. My only complaint is that Spa and drink prices were very expensive and the Wifi was not consistent (kept logging you off). I would however, recommend. ..Celsius. There’s a sticker on the wall saying it’s the perfect temperature and a lock on the contol wheel not letting you turn it under 25 degrees. And the thick super warm duvets are not ideal to sleep in 25 degrees especially given it’s a tropical place with way hotter temperatures outside. Aside from this issue everything else was impeccable. Very clean, all kinds of things to do and see , price was excellent, staff was extremely helpful and friendly , spoke English very well, communicates well, and it felt like home. It was the best tropical vacation ! They have problem with the hot water. Internet constantly dropping and you have to re connect every time. The breakfast is average unless you like Thai food. The room was spacious but the air conditioner was blowing right at your bed. Pros - you can walk through the resort to east and west beach. Cons - getting to villa down alleyways, pool has limited space and beds, doesn’t offer good value for money compared with alternatives in the area, we had a private villa with jacuzzi but the jacuzzi didn’t hold water. There was only one conn - there is a drain smell in the bathroom. I think it’s becasye the place is so remote and the septic system doesn’t cope so well. The hotel were very good and came to get rid of it when they could. The place was always clean. I loved everything about this hotel. The location the breakfast the location the island absolutely everything. Just be warned. Don’t book excursion form the hotel. They charge much more than booking the same thing at the village. Otherwise a must in every way. It was mine and my family first time in Krabi and we really enjoyed our stay here. 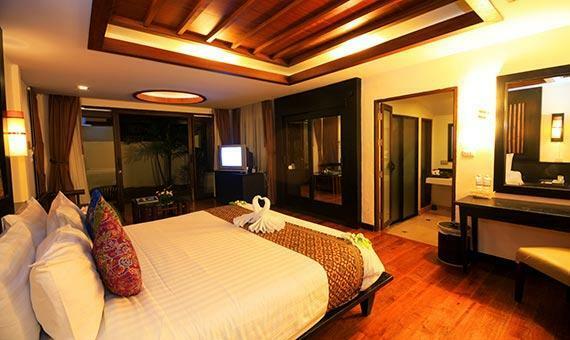 We booked the 2 bedroom pool villa and the children loved it! It was walking distance from the beach and the staff were very friendly and so helpful. The staff at the front desk was patient in answering our inquiries and really helped us in choosing the different tour packages. Would definitely go here again! 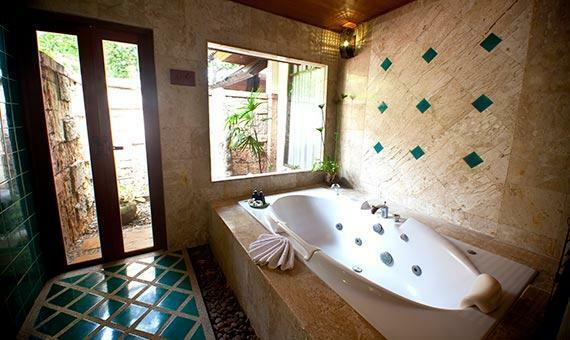 We had the Privacy Cottage with Jacuzzi. It was a very large cottage with a nice outdoor area. Everything was clean, new and functioning. We asked for the Western location and were lucky to get it. However, the resort stretches all the way to the East beach, which makes for a shorter walk to the Phrang Nga beach but longer walk to breakfast and Railay West. I think regular rooms and cottages can be dated and small and many located on the East side, judging from other reviews. Overall, the resort is pretty with a great location on the beach and pool with beach view. Staff has very limited English and cleaning staff always came in the afternoon when we came back from the beach. Breakfast was a bit disappointing: some days local food options were good, other days terrible. Omlets most of the time were undercooked even after asking 3 times for well-done. However, it was our anniversary and we got a nicely decorated room and cake. We enjoyed our stay a lot.